A typical requirement within a BW Project might be to offer Master Data Maintenance to End Users. E.g. to maintain specific global BW hierarchies. In the following figure a compoarison between different approaches can be found. Within the next chapter we will go into the details of the BPC Embedded approach. 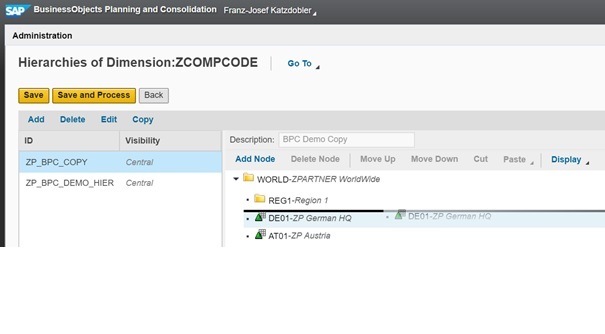 SAP BPC Embedded offers a very convenient way to offer master data maintenance to end users. In case you have PAK enabled on your system, it should be considered as an option before going for a custom development (same license). BPC Business Users can maintain hierarchies directly in HTML based web admin client with improved usability. Let’s walk through the high level architecture of the functionality. The handling is very user friendly, e.g. you can work with Drag & Drop. The users can create hierarchies, change hierarchies, add text nodes and also add leaves depending on their authorization granted via S_RS_HIER in the BW System. From the author’s point of view the given approach is very powerful with low implementation effort (some hours). In case BPC Embedded is available on your BW system it should be considered as the preferred option before going for a custom development. Especially for hierarchies a custom development is complex to implement. Functions like Drag&Drop or re-organizing a hierarchy might lead to high implementation effort. BPC Embedded deliveres these features without additional implementation effort.